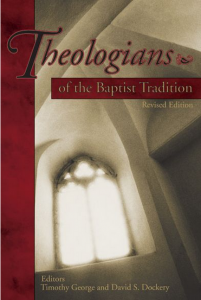 This is a revised edition from the 1990 edition titled Baptist Theologians by the same editors. I enjoy books like this that give us a short biography of well-known men in history plus some important facts about their theology. Familiar names appear such as John Gill, Andrew Fuller, Charles Spurgeon, A.H. Strong, and even B.H. Carroll, and then some not-so-familiar names such as John Dagg, Walter Conner, and Frank Stagg. I have not yet had time to read the original edition which contains many more names and, some readers have told me, contains a less bias view toward Southern Baptist theologians who were heavily Reformed in theology. An example in the present edition is the extended negative critique of A.H. Strong’s theology, though much of it may have been justified, compared to the brief overlooking of B.H. Carroll’s heavy leaning toward Landmarkism. Still, facts are facts and we take the good with the bad in anyone’s history. It all helps us be more balanced and true with our own views. Baptists have a very rich history in theology, education, local church ministry, and evangelism. I appreciate every addition to that heritage.